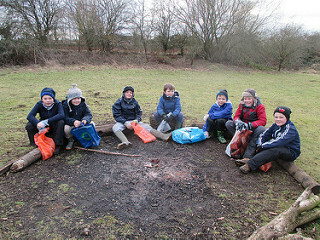 Seven Cubs, who enjoy being outdoors, took part in our annual Litter Pick at Horley Scout Camp Site, braving the cold to spend two hours collecting rubbish off the main camping field and also the individual camping spots tucked away down the bottom end of the camp site. This is our way of doing something for the camp site, which we use on a regular basis, and at the same time, showing the Cubs parts of the camp site that they don’t usually see. Surprisingly, the camp site was fairly free of litter but we still managed to collect three refuse sacks full, mainly from where litter had blown into the perimeter fences or hedges. A very productive afternoon for the Cubs and Leaders who took part.